After playing competitive basketball for the first two months of the season, Duquesne has been bullied by their A-10 counterparts since the beginning of conference play. The wheels really started to fall off for the Dukes in January, when the team started an eight game losing streak, and wrapped up the regular season losing 13 of their last 14 games. 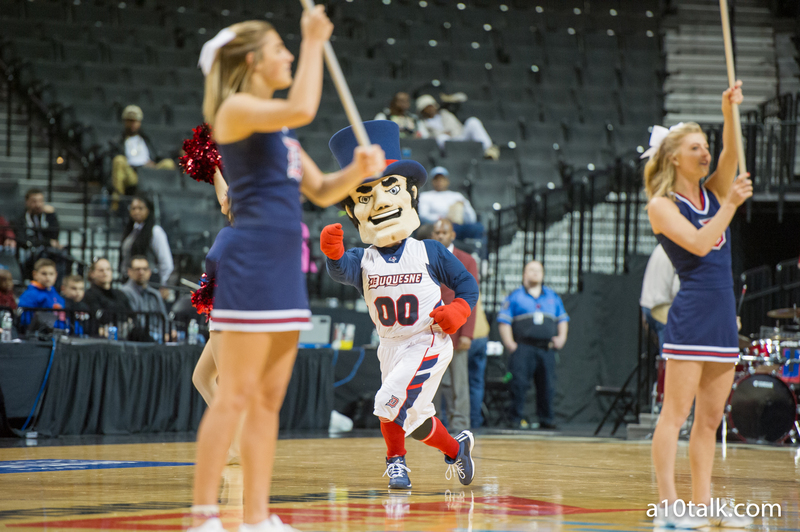 As the lowest seed, Duquesne is a long shot to make a significant run in the Atlantic 10 tournament. However, here are three keys for Duquesne to make their mark in their own city. Duquesne is going to need their Atlantic 10 All-Rookie team selections Mike Lewis II and Isiaha Mike to put up some big numbers to advance in tournament play. Lewis II currently leads the team in scoring, averaging 13.9 points per game, and has put up seven 20+ point performances this season. Isiaha Mike is the third leading scorer (11.2 ppg), and recorded two double-doubles in conference play this season, including one coming against Duquesne’s first round opponent, St. Louis. The freshmen are the heart of the Duquesne’s offense, and they will need their young nucleus to lead the way if they want to make some noise this week. Turnovers have plagued the young Dukes squad all year, and the team averages just over 14 giveaways per game. At the beginning of the season, it was expected that a team with just four returning players from the previous season may take some time to gel and that would lead to turnovers, but now it’s way too late in the season to use that as an excuse. In nine conference matchups this season, the opposition has forced 14 or more Duquesne turnovers. The team has been sloppy all season, and if there’s no better time to fix that than now. The Dukes must clean up their offense to be successful in the A-10 Tournament. Issues on the defensive side of the ball have been an issue for the Dukes for the past few seasons, and this season wasn’t an exception. Duquesne was last in the conference in scoring defense this season, allowing 74.3 points per game. That puts them 222nd in the nation. While they are more than capable of finding an offensive rhythm, opponents have been able to do whatever they want to Duquesne’s defense. If they are able to buckle down defensively, it will greatly increase Duquesne’s chances to make a push.